I’m having an extra-strength Monday. Mr. Karen hired a snow removal service this year for the first time, and so far it’s not working out as well as I’d hoped. Instead of shoveling resignedly before I leave for work, I shovel angrily because I think the service should have cleared the walks already, and this morning I was out there again, muttering under my breath as I dealt with the snow before climbing into my car for an extra slow and annoying commute. Friday the service did come and finish the driveway at around 10:30 a.m., just before we left for Illinois for the weekend so we could be there for his dad’s memorial service and related events. (The long gap between his death and the service allowed more relatives and friends from his decades in the ministry to attend.) The drive there proved to me more of a trial than we’d expected. Mr. K checked the weather before we left, and it looked like we’d avoid some lake effect snow if we took the slightly longer route along the Indiana Toll Road. As it turned out, we couldn’t have gone our normal path anyway, as that morning there was that huge chain reaction accident on I-94 near Battle Creek that ended up involving 190+ vehicles and closed the freeway for nearly two days. The alternate route was not smooth driving, though, since the snow went farther south than we’d expected and the Indiana Toll Road was also partly shutdown due to an accident. We ended up bailing out of the backup and winding our way through South Bend, taking a two-lane highway over to I-94. All those delays meant we hit the start of rush hour in Chicago once we got that far. Our six-hour trip turned into a nine-hour one, and instead of having time to relax before the family dinner that night, we went straight to the restaurant, arriving after the appetizers. We still had a better day than my sister-in-law Faye and her husband, who spent a couple hours sitting on I-94 behind that closure, then more time in the backup on the Indiana Toll Road, which we didn’t know about yet when they called us to see how we were doing on our journey (we talked again when we did know about it and told them how we’d changed our route but they apparently decided to not take any more advice from us that day). Once we did get there, the weekend was packed full of emotion, with large and small family gatherings and the visitation and memorial and reception bringing both tears and laughter. I did my best to be kind and helpful and supportive, but fell short in a few instances, which I regret. I could have gone by the house on Saturday to see if anyone needed a ride to the church after I’d dropped off Mr. K and Faye for the visitation; instead I went to check in to a new hotel where I hoped we’d get a better night’s sleep than we had on Friday night (we did, as it turned out). In my defense, they did have two vehicles available that together had enough seating for everyone staying there, so I didn’t think it would be a problem, not realizing that they weren’t using the second car but running shuttle with only one. I have no defense for another incident, in which I argued with my sister-in-law Kathy on Saturday night about how long her car was in our garage in Idaho. (This is the vehicle Mr. K and I brought out from Illinois for her in December of 2012, that she was supposed to come get in January of 2013 but couldn’t for some reason, so it sat in our one-car garage for weeks after I’d expected it to be gone, forcing us to park in the driveway and move our truck so the plow could clear the snow on our later ski trips that season.) She’d had a more trying day than I had, and I should have just backed off, regardless of how right I thought I was or how off kilter I felt from being outside of my highly sensitive person comfort zone for so much of the weekend up to that point. On our way home Sunday, Mr. K and I stopped to visit with my mom and have lunch with her. She’s doing surprisingly well, I’m happy to say. If I’d known what the weather was going to be like, I might have suggested we do brunch instead, as we ran into snow just past Chicago and the roads got worse and worse, to the point where we were going about 40 on the freeway most of the way through Michigan. The drive didn’t take quite as long as it had on the way out, but we still got back a couple hours after I’d hoped to, which means I got nothing done last night and will have to squeeze that stuff into an already busy week. Ah well, that’s the way it goes sometimes. I leave you with this photo of Dale that didn’t make the cut for the memorial slideshow. 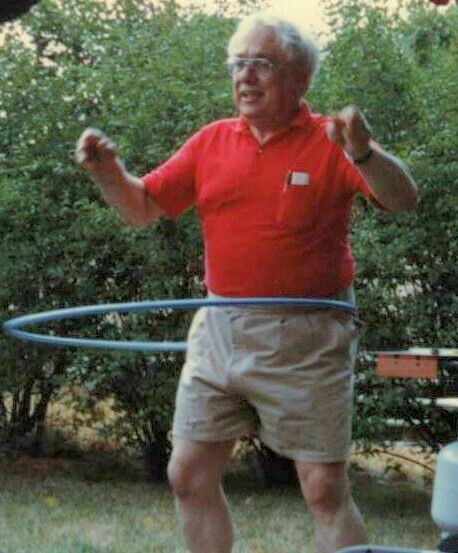 Here he is in his 60th year, Hula Hooping at a family reunion. This wasn’t the only time he did this, either, as we have a photo in our album from a different year with a different hoop. I hope he’s having this much fun wherever he’s at now. That’s a great picture! Hugs to you and Mr. Karen, and I’m glad to hear your mom’s doing well!